In a technology dependent society, it is certain that a gift of technology will be a winner! Take a look at these really great and affordable technology gifts for the holidays. For the one that is always on the go, this AUKEY 20000mAh portable mobile battery pack charger from AliExpress will be a life saver when they need to recharge! This Propel RC Cloud Rider stunt drone from Office Depot will be fun for adults and kids alike! Any kid, or an adult who is a kid at heart, will be thrilled to receive this as a gift this holiday season. Many people choose to listen to music or watch movies from their home computers. More storage space for music, movies, and pictures would be a great gift for those who are into home entertainment. This My Passport Ultra Metal Edition external hard drive from Best Buy will be all they need with a full TB of extra storage space. This external hard drive is also portable for those who are on the go. The Roku 3 streaming media player from Target will be the ideal gift for those who enjoy relaxing with a good movie or TV show. This media player has access to over 250,000 different programs. It also features voice search and a headphone jack for private listening. Check out this Nook GlowLight Plus from Barnes & Noble for your favorite book worm. They will love this e-reader that is suitable for reading in daylight or at night. With access to thousands of books, they will never be without something to read no matter where they are! This Nook features a built in Wi-Fi to download books from anywhere. This Microsoft Arc Touch wireless mouse from Staples will be a great gift for your boss or co-worker. They will love the comfortable design and precision of this mouse that is made to fit right or left handers. Who doesn’t like to proudly display photos of their family? This 7” Supersonic digital photo frame from Fingerhut will display 100’s of cherished family photos. This frame features many different settings to fit anyone’s taste and style. If you are looking for a great gift for the gamer on your list, then this Sades 7.1 Surround Sound USB Gaming Headset from GearBest will be just what you’re looking for! They will love how the high quality sound immerses them in their gameplay. This headset also features a voice activated mic and led light to enhance their game. This Midland X-TALKER T51VP3 2-Way Radio set from Tractor Supply will be an awesome gift for the hunter on your list. This radio set will help them keep in contact with their hunting partners easily. With hunting season right around the corner, now is the perfect time to give this wonderful gift! Just about everyone has more than one device that needs charged. This 4 port USB charging hub from Bed Bath & Beyond will give them the extra charging space they need to charge 4 things at once without the clutter. This Acurite Weather Station from Kohls will help them be prepared for any type of weather. This weather station features a full color screen and provides information for indoor and outdoor conditions. Do you want to save even more? You can cut down on your holiday costs by earning cash back through Giving Assistant at these stores and many more. Head over to givingassistant.org for many cash back offers, coupons, and money saving tips to make the most of your holiday shopping. I don’t know about you, but I always have a hard time figuring out just what to get the men in my life. Don’t waste another moment trying to figure it out! Use this holiday gift guide to find all the men on your list the perfect gift. You can’t really go wrong with sunglasses no matter who you are shopping for. Something every man can use year-round, and looks good on anyone! These Dragon Vantage sunglasses from Backcountry would make a great gift for the difficult to buy for. These sunglasses come in 8 different colors to fit any style or color preference that you are looking for. For the DIY man in your life, check out this Makita 6.5-amp top handle jigsaw with case from Home Depot. He will be prepared to take on any project or chore with this popular saw in his collection. Give him something to help him feel clean and refreshed over the holidays with this Mankind Dopp kit from Macy’s. This fragrant kit smells great and comes with the bag, spray, after shave, and shower gel. Do you have a gamer on your list? If so, then this Kraken 7.1 Chroma surround sound gaming headset from AliExpress may be just what you are looking for. Powered by cutting edge virtual surround sound technology, this headset will immerse them in their gaming experience for hours on end! The fitness buff will enjoy receiving this Fitbit HR activity wrist band from Sears as a gift! This activity wristband will easily help them keep track of daily steps, calories, sleep, and more. The simple design and basic color will blend into any style perfectly. Look no further than Staples for a great gift for your boss or co-worker! This gorgeous Howard Miller alarm executive desk set clock is the perfect gift. This desk set clock also doubles as a pen and business card holder. With the beautiful rosewood finish, this piece will look great on any desk. You can help him stay warm during the chilly winter months with this Merino wool hat and gloves set from Ralph Lauren. This stylish set also features touch screen compatible fingertips so he won’t have to remove his gloves to use technology. Who doesn’t have a coffee lover in their life? This holiday coffee brewing set from Starbucks features a Bodum Chambord 8 cup coffee press with 1 pound of Starbucks Christmas Blend 2016. This tasty gift will hit the spot with your coffee lover this holiday season! The NFL watch and wallet gift set from Kohl’s is a great gift for the man that loves sports. There are many different teams to choose from so you’re sure to find his favorite. The outdoorsman on your list will appreciate this Northface apex chromium thermal jacket from Moosejaw. Windproof and water resistant, he will thank you on cold, winter days! The business man on the go will be able to stay organized with this Bellino briefcase from eBags. This briefcase has plenty of room and pockets for organizing. It includes a shoulder strap, and a space for carrying a laptop. Save on this and more with eBags coupons. You can cut down on your holiday costs by earning cash back through Giving Assistant at these stores and many more. Head over to givingassistant.org for many cash back offers, coupons, and money saving tips to make the most of your holiday shopping. Do you have a bookworm or word nerd on your list? How about a film lover, incessant doodler or aspiring brewer? Don’t give a lump of coal–show your friends and loved ones they’re on the “nice” list with a gift that suits their interests from Barnes and Noble. Don’t forget to grab a 10% Off Barnes & Noble Coupon & 6% cash back at our store page. Give a gift that will get everyone in the holiday spirit–a holiday movie! A Christmas Story is sure to get friends and loved ones of all ages laughing. It’s a Wonderful Life is a heartwarming tale that will give a sense of perspective amid the hustle and bustle of the holiday season. A Buddah Board makes a cool, zen accent for an office or room. Dip the brush in water and create a unique pattern on the board. As the water dries, so does the design, eventually clearing to a fresh, blank slate. This is the gift of a serenity! There is perhaps no better gift for children than books. They’re more than entertainment or education–they can be a portal to a whole new world. A classic book like Shel Silverstein’s The Giving Tree, Frances Hodgson Burnett’s The Secret Garden, or Dr. Seuss’s Oh the Places You’ll Go! never goes out of style. Or, give a gift that will keep your young reader entranced well past the end of your holiday gathering with a box set like the Harry Potter Paperback Box Set, which includes all seven Harry Potter books. For music lovers who appreciate retro cool, give Crosley’s Chalkboard Cruiser Turntable. This three-speed turntable has built-in stereo speakers, RCA outputs and a headphone jack. The outside is a chalkboard, so the lucky recipient can doodle and customize the outside. If you’re looking for a gift for an artist, consider the Pencil & Pastel Wooden Art Case. This 54-piece set comes with everything a budding artist needs to create a whole range of projects. From colored pencils to soft pastels, charcoal to graphite, plus essentials like a sponge, pencil sharpener and brush, this is the perfect gift for a creative friend. If you have a true beer connoisseur on your list, why not give him a set for him to try his hand at his own brew? The American Pale Ale Home Beer Brewing Kit comes with everything he’ll need to create a crisp, hoppy, bitter pale ale. If pale ale isn’t his beer of choice, you could also gift a Hefeweizen Craft Beer Brewing Kit or a Dry Irish Stout Craft Beer Recipe Kit. For a gift that keeps on giving, why not give a cookbook? Barnes and Noble has a huge range of culinary bestsellers. Give Make It Ahead: A Barefoot Contessa Cookbook to a friend who loves to cook and entertain–and doesn’t want to spend all his time stuck in the kitchen at his own party. Or, if he’s looking for recipes that are big on taste but low on calories, try The Skinnytaste Cookbook: Light on Calories, Big on Flavor, written by the author of the wildly popular Skinnytaste blog. is a great gift for a voracious reader. The crisp, bright display makes it easy to get lost in a book. This e-book reader has a 6-inch display, 8 week battery life and lightweight construction. From curated collections to book recommendations, plus access to over 3 million titles in the NOOK Store, this gift ensures the reader will always have a new book at her fingertips. Now go, gift and make merry! With the look of a gadget straight from the future, the energyEGG is ready to be your household helper. Find out how this innovative device can save you big bucks on your energy bills and prevent the release of CO2 into the atmosphere. This device has one job: to turn electronics on and off as people enter and exit rooms. It sounds simple, but this one action can be crucial to drastically lowering energy costs in your home. A few saved watts here and a couple more there seriously add up in the blink of an eye. This concept is similar to smart thermostats that lower HVAC usage when no one is home. We all tend to get caught up in our busy lives, and so we often forget to make energy-saving choices. Think about the many times you’ve finished watching TV, left the room with your hands full, and neglected to turn off those devices and lights for hours! energyEGG steps in to rectify that. Improves home safety: Never worry about leaving the iron on again. Reduces energy consumption: Lower your bills by turning off what you’re not using. Is easy to use: It’s automatic and can be controlled via remote. The energyEGG is a sensor that wirelessly controls a number of specialized plugs. The EGG itself uses “SitStill” technology, a motion sensor that detects when people enter and exit a room. It turns devices on instantly and off according to a preset timer. It also cuts so-called “vampire” or “stand-by” power from devices that draw energy even when they’re turned off. How many plugs can the energyEGG control at once? The basic energyEGG unit controls up to 10 wall plugs, and you can expand its usefulness by connecting the plugs to surge suppressors instead of individual devices. This makes it easy to customize what gets turned on and off. The unit can also be controlled manually using either a remote or a button on the EGG. The energyEGG has had wild success in the U.K. Users love how easy it is to control, even from a distance. It’s even found itself a niche market for people with limited mobility who struggle with out-of-the-way plugs. If your TV and cable box are left on for even a couple hours a day, the energyEGG can pay for itself in just 12 months and prevent the release of hundreds of pounds of CO2 into the atmosphere. The energyEGG website offers a calculator that estimates your savings, and users attest that the projections are accurate. If you really want to see the difference energyEGG can make, snag a home energy monitor from New Egg and watch how much your savings compound over time! Sounds Great! Where Can I Get One? The energyEGG is available through Amazon. Everything you need to set up your EGG, even batteries, is included. The basic package will include the EGG and one wall plug, and extra plugs will be available for purchase. In less than 10 minutes, you can be set up and saving energy with your very own energyEGG! Hosting a dinner party at your place can be loads of fun, but it can also mean hauling around clunky ice buckets and serving rather watery alcoholic drinks. Sure, your friends will politely smile and say the wine is delicious, but what good is fancy wine if it’s gradually warming up and watering down? Take the hassle, expense, and mess out of your parties by allowing a self-chilled wine glass, such as the Host Freeze Cooling Wine Glass, to stay perfectly cold and full of flavor for your (genuinely) delighted guests! How Does the Self-Chilled Wine Glass Work? No need to station cumbersome, unattractive coolers at your event. These glasses stay chilled for over an hour. Simply grab the freeze chilling glasses out of the freezer, deliver them to your guests, and let the party begin! 1) Doesn’t shatter like glass. The self-chilled wine glass is perfect for both indoor and outdoor parties. 2) No more drinking watered-down alcohol. 3) Save money and time. The cost of buckets of ice adds up, and who has time for all that set up? Ice melting in heavy buckets is a serious pain to clean up post-party. 5) No need for coasters. The self chilled wine glass can sit on most surfaces without a coaster – dining tables, buffet bars, or picnic areas! Never stress about careless guests leaving drink ring marks on your table tops again. 6) Rubber grip means no frosty fingers. Holding a freezing wine glass for hours can lead to very numb fingers! No more. 7) Made with BPA-Free plastic. BPA – a chemical found in plastics – can seep into food and drinks and has been linked to many health problems, including: breast cancer, obesity, prostate disease and cancer, miscarriage, and impairment of the immune system. Use the Self-Chilled Wine Glass for Other Drinks, too! You don’t have to limit the use of these nifty glasses to wine sipping. Try pouring beer, juice, tea, and water into them for long-lasting cold drinks. This is a major plus for guests who don’t drink alcohol. They’ll fit right in with virgin cocktails in these thermal-insulated handheld coolers! 1) For large events, you’ll need several sets. 2) Not ideal for parties lasting much longer than 1 hour. 3) Require hand washing (can’t go in the dishwasher). When used properly for shorter and smaller events, the self-chilled wine glass is a trendy, convenient alternative to hefty buckets of ice and watered-down wine. Where to Find a Self-Chilled Wine Glass Set? 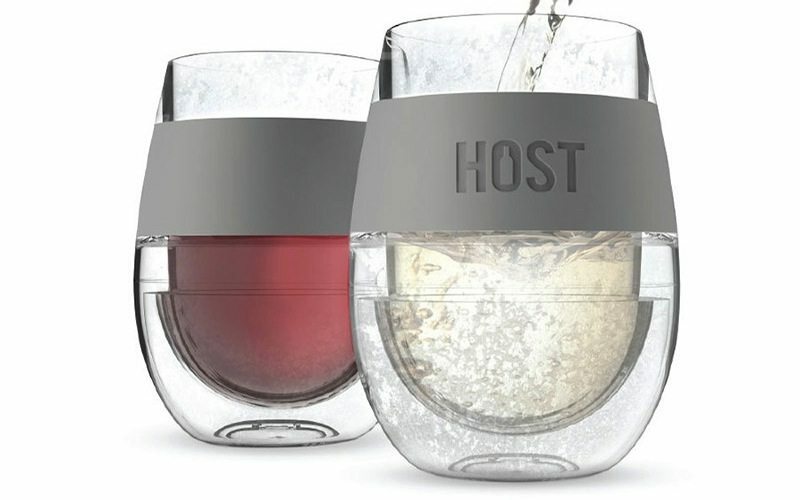 You can find the Host Freeze Cooling Wine Glass at Amazon. Another wonderful choice is the brand Soiree Home. They have a Dimple Glass Self Chilling Glassware Set, available at Nordstrom. Party on!